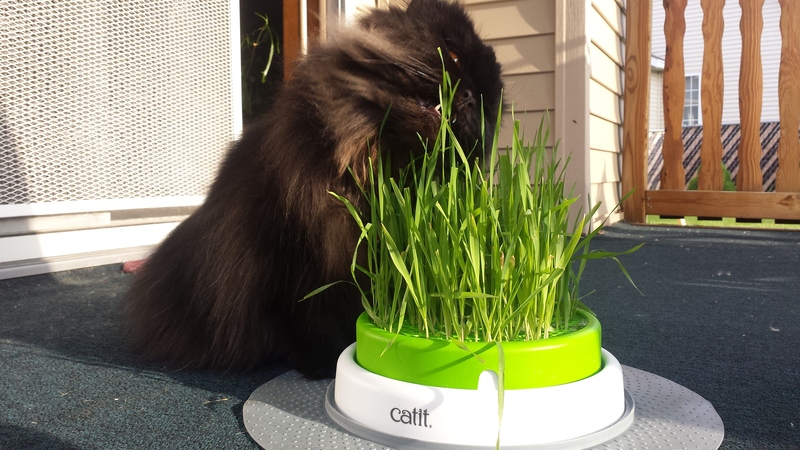 I have some exciting products to share with you from Catit. They are a well known company with some unique products and the one I have is called the Oasis that is fit for a King or Queen. This is the ultimate cat product collection with many activities to do with your kitty or even grow catnip for you kitty and they will definitely love you for it! 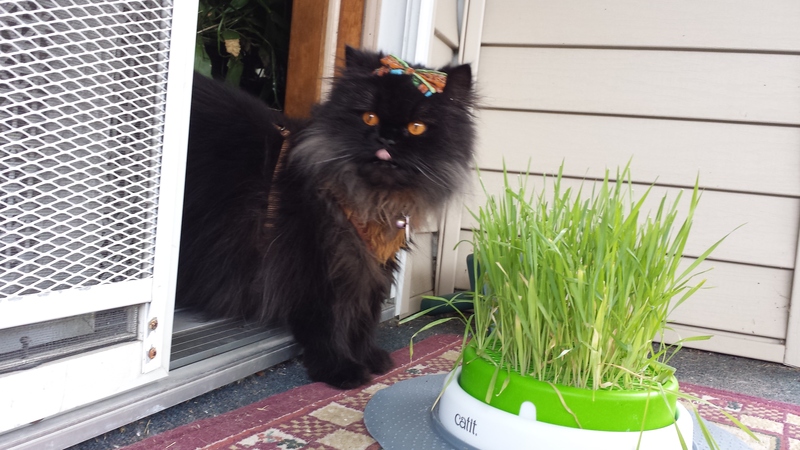 My mom grew my catnip infused grass for me and it only took 5 days. 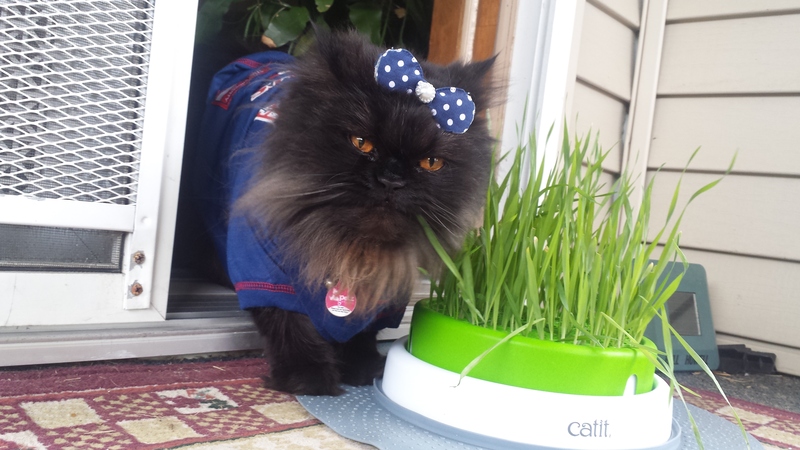 And this is my catnip infused grass after 2 weeks, .Pawsome, Right? You can cut it and dry it to save for another time. even add it to the Wellness Center. 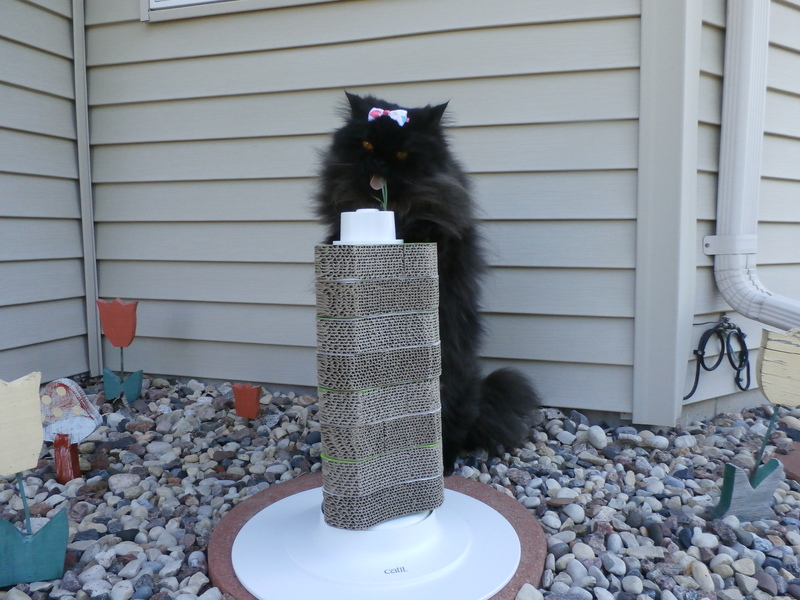 Flower fountain and food multi feeder are just amazing besides the fountain is very quiet too. 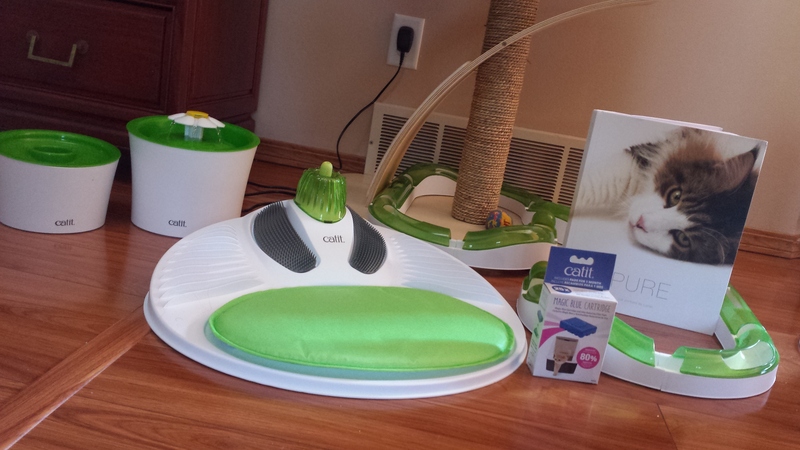 I just love all the Catit Products they are easy to clean and what is really neat about this scratcher is that if your cat scratches and wears down one of the cardboard discs they can be replaced for a fresh new look. 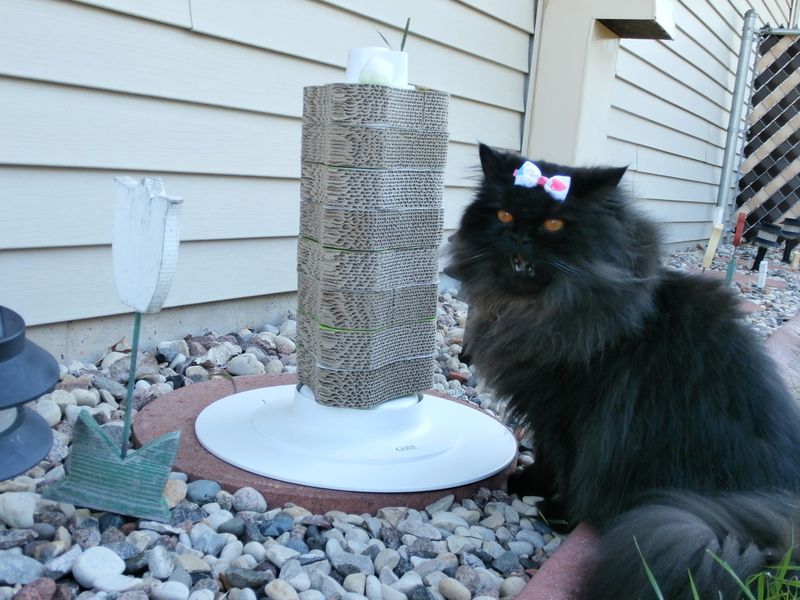 Mom put my scratcher outside and we played a game with blades of grass sticking on the top of the scratcher for me to try and get it. My wellness center has a place to lay down to relax and a spot for your catnip infused grass even a spot to rub your face on..
Catit has thought of everything for us Kings and Queens and you don’t want to miss any of these products it even comes with a book full of beautiful pictures of kitties playing or just looking cute. The Oasis also comes with a litter filter called the Magic Blue Cartilage to help my kitty box smell fresh. I can say that this Oasis has a little of everything you might need especially if you just got a new kitten. I bought the fountain! A few weels ago. My female loves drinking from the fountain, while my tom prefers his bowl with water. But even the female took about a week to get used to that new thing. So if you buy a new feeder/fountain – have some patience. Me too – i.e. I am happy, too – otherwise it would have been a waste of money. I agree with you. It’s quiet too. It is indeed, but I still draw the plug at night. Lovely photos, Angel’s Eyes. ? That catnip planter thing looks awesome! I love the catnip planter too! It’s design and the quality of the catnip is amazing. I love when you come to Katzenworld and do reviews Angel. 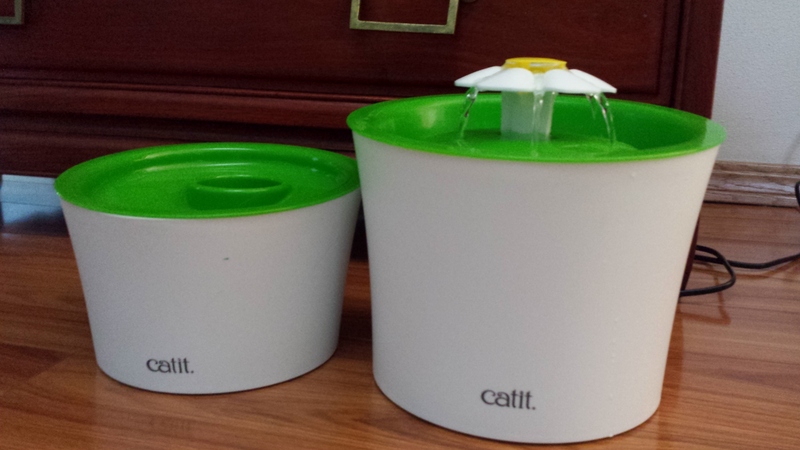 Catit things are indeed easy to clean and well made. We have the fun puzzle feeder and a little station with the face rubbing catnip container but I will have to get the one you showed with a place to lay down. My Mi Sun will love that. She’s the big chin and cheek rubber and she’s also just a bit lazy. Thank you, The Wellness center you are talking about it is very nice the pad is removable for cleaning and has a place to add catnip or you can put treats there too. I forgot to mention we are on every Thursday on Katzenworld and have some exciting giveaways coming soon. Thank you Denise they are wonderful products. That grass grower looks good. You are such a cutie. It is amazing it comes with everything to grow it too. Angel you are v. lucky. My human says our place is too tiny for big toys. Teach me how to manipulate my human please.